I have been looking at a lot of critter line up cards. I thought why not I give it a go. 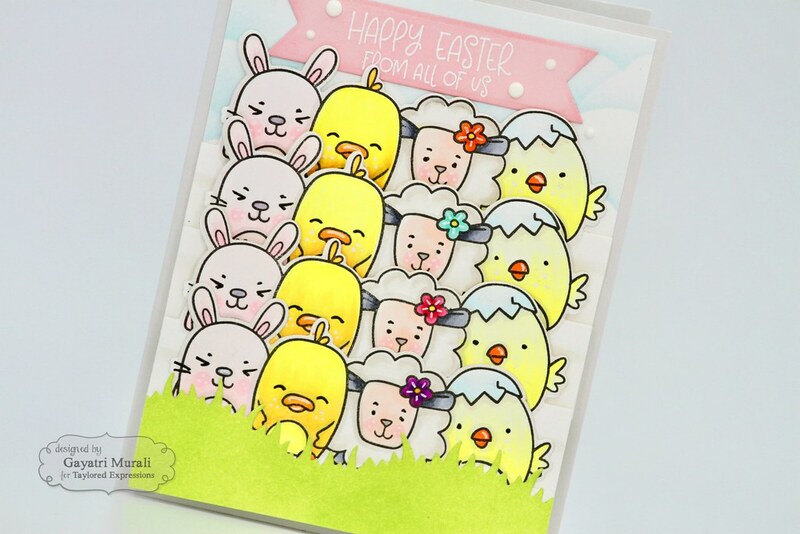 Hello lovelies, I have an easter card share using Taylored Expressions products released earlier this month. 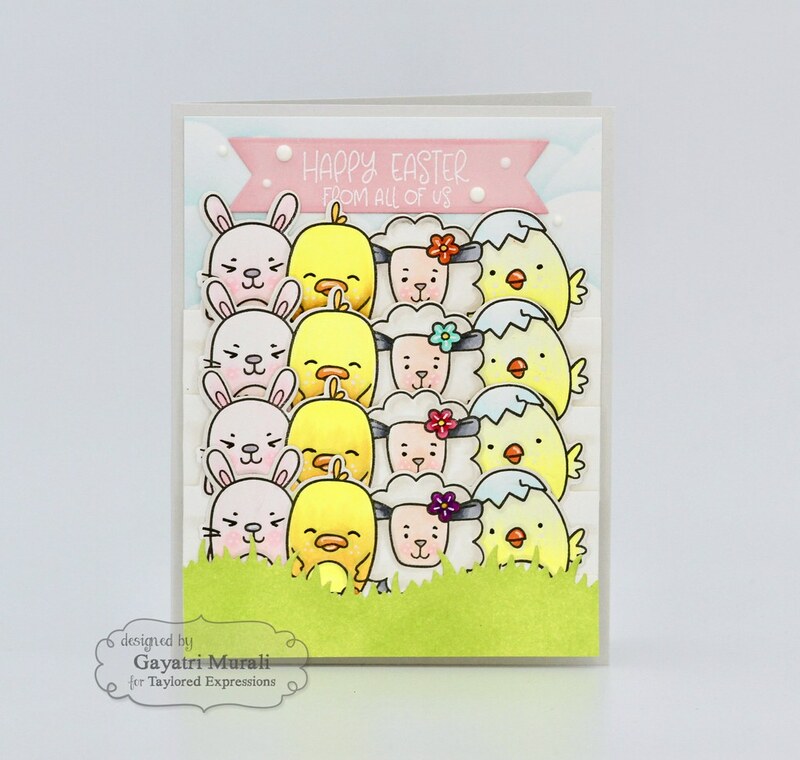 This card uses the new Cutting Edge Spring stamp and die combo stamp set along with a few other older products. This is an easy card to make as well. 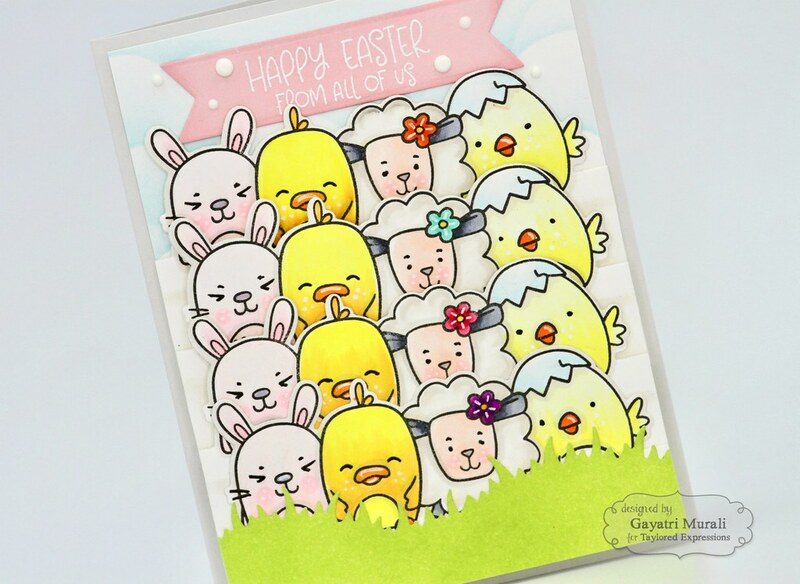 I stamped a few of the critter image from Cutting Edge Spring stamp and die combo set using Oreo hybrid ink. This ink is copic compatible. Then I coloured using copic markers. Using the die from the set, I die cut them all out. To create a scene, I sponged Sprinkles ink over the Rolling Clouds stencil on a Sugar Cube panel to make sky background. For the grass, I die cut Build a Scene Grassy Hills die using Sugar Cube cardstock. Then sponged Granny Smith and Cilantro TE dye ink. I stamped the sentiment on Pink Champagne cardstock using versamark and white heat embossed using Te detailed white embossing powder. Using the largest Double Ended Flag die, I die cut the sentiment out. To line up the critters, I used a thin long white scrap cardstock and glued the critter in a line tucking in a bit of the bottom on the previous layer. I adhered this on the sky background panel with the grassy hill die cut on the bottom. The sentiment I adhered on the top of the panel using foam adhesives. Finally added details using white gel pen and white crystal drops. The completed panel is adhered on Sea Salt card base. The Sea Salt is my new favourite neutral card base. Its a beautiful light grey cardstock. A must have in your cardstock collection. 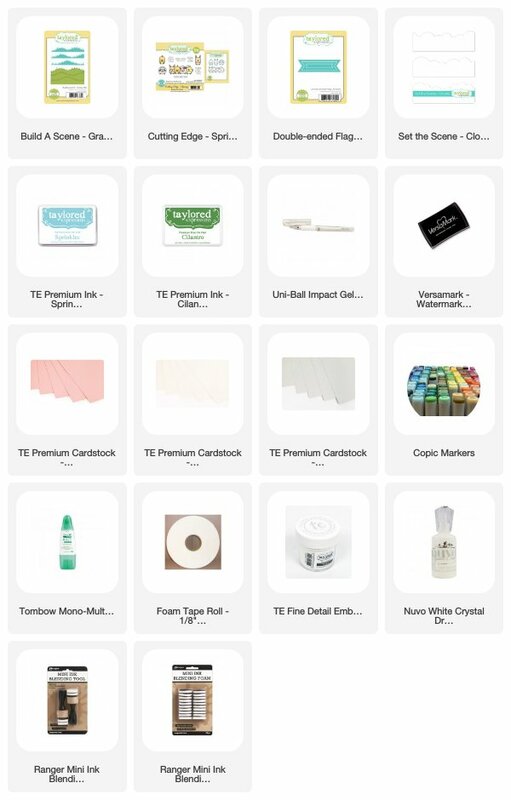 All the supplies used to make this card is listed below for you. Thank you very much for visiting my blog today. Have a lovely week!